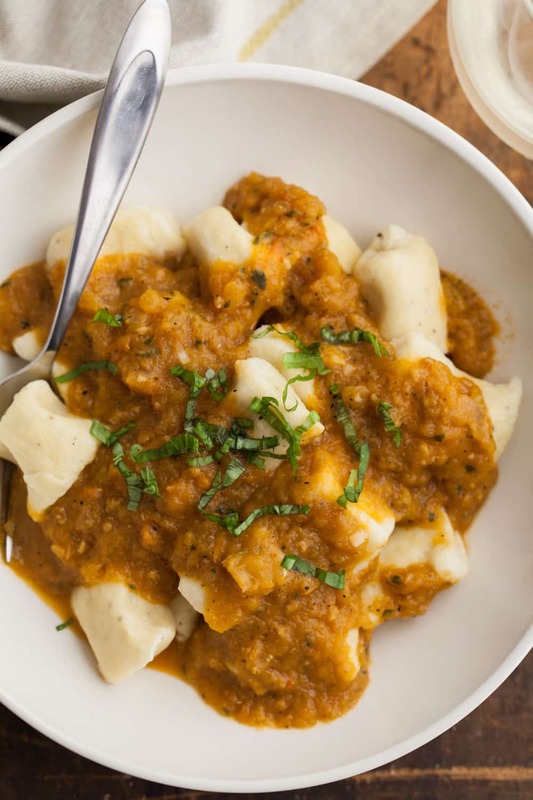 Einkorn Ricotta Gnocchi with Roasted Tomato Sauce | Naturally. I mentioned in my last post that I’m a fairly simple girl when it comes to summer meals but on occasion, usually when there are guest in the house, I like to step my cooking game up a bit. A few months ago I made these ricotta gnocchi for The Kitchn (using Emma’s ricotta recipe) and I fell in love. I typically go the potato route with gnocchi but after one bite of ricotta gnocchi, I couldn’t go back. 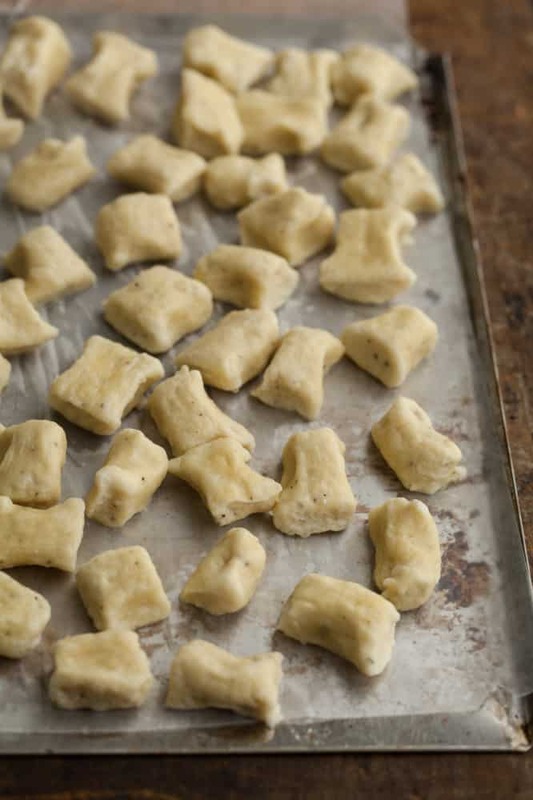 These gnocchi are truly the fluffy, delicious bites one would expect (and not too hard to make.) The perfect showcase for a summer tomato sauce. Einkorn flour can sometimes be a bit tricky to work with as it doesn’t absorb water the same as the all purpose flour. This gnocchi dough is a bit stickier than the original recipe, but use extra flour for shaping the gnocchi and be patient- don’t add extra flour to reach a tacky consistency, you’re gnocchi, after cooking, will become dense and not be the dreamy/pillow-like texture I love so much. 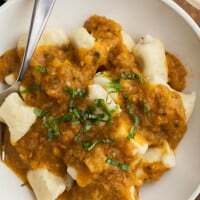 Prepare gnocchi as guided, using einkorn flour in place of the all-purpose. See summary for information about working with Einkorn flour. Preheat oven to 425˚. Roughly chop tomatoes, onions, and mince garlic. 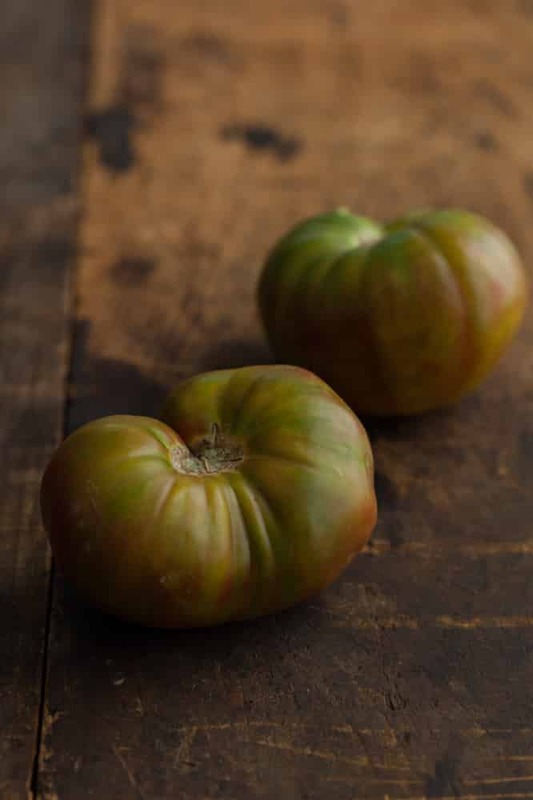 If tomatoes are overly juicy, squeeze out excess. 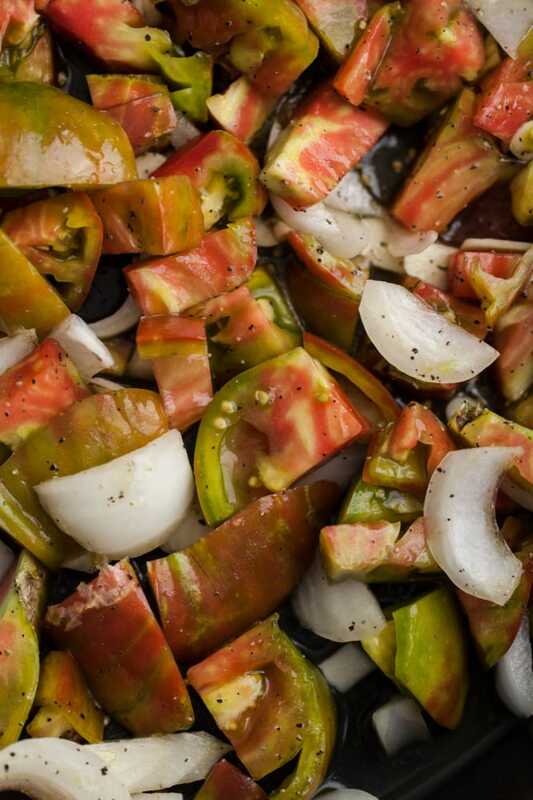 Place ingredients in a roasting pan and toss with 1/2 tablespoon of olive oil. Roast until everything is tender, 20-25 minutes. Let cool slightly, drain any excess liquid that formed while roasting, and then transfer to a food processor or blender. Add lemon juice, basil, salt, and pepper and puree until well combined. Serve gnocchi hot with tomato sauce and an extra sprinkle of fresh basil. So so gorgeous!I feel like this captures the true essence of the end of summer! Ill have to try and hunt down some enikorn flour!! This looks great Erin! I have yet to work with einkorn flour, but this has motivated me. Looks and sounds delicious! I’m adding this to this week’s menu! I have sooo many tomatoes and fresh basil! 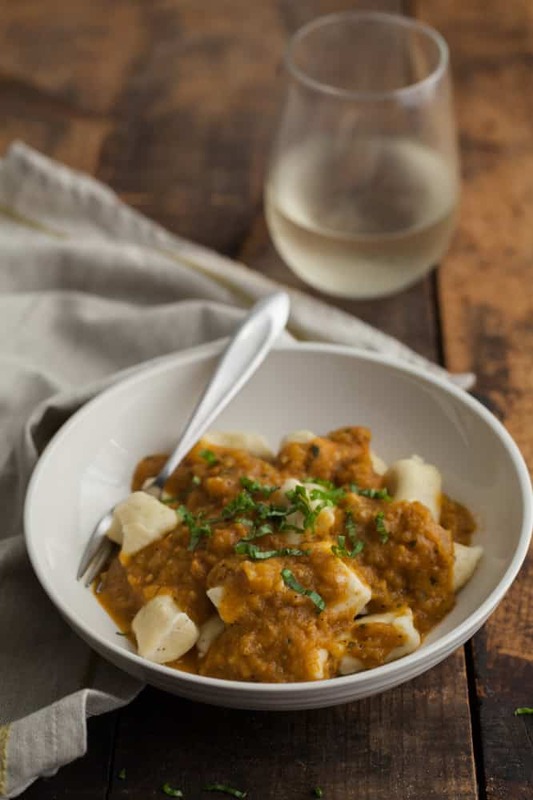 Well this sauce sounds absolutely lovely paired with those fluffy cheesy ricotta bites! The tomato sauce was delicious, thank you so much for the recipe! Made exactly as written, was a lot of work, but each step was easy. Sauce was delicious. Ricotta to die for! Thank you!! When making the gnocchi, should I add the full cup of einkorn flour up-front or just the 3/4 cup the original recipe calls for? Start with the 3/4 cup and if it’s really sticky, add the extra. This was sooooooo good. 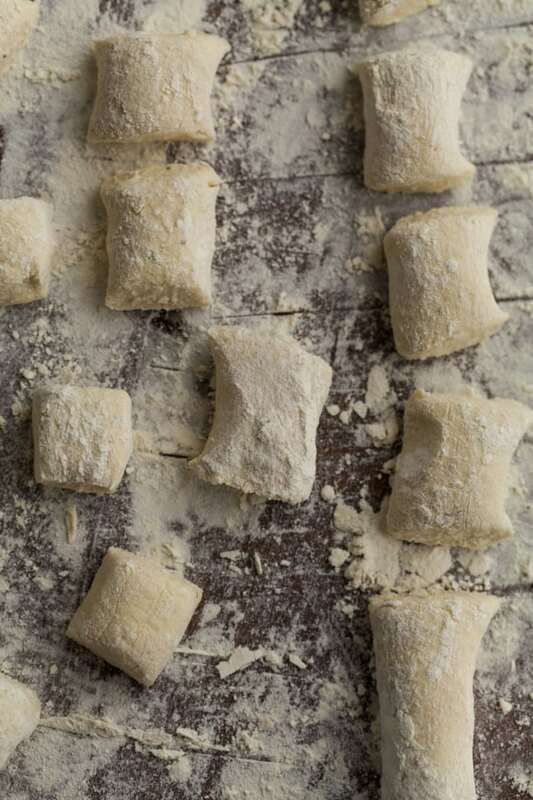 I used King Arthur AP flour & the gnocchi were perfect – just like I had in Rome. And the tomato sauce I could eat all by itself, it is seriously that tasty! Thank for the recipe, it’s so helpful! One of my best, best friends has gluten sensitivity, so her family uses einkorn flour because it doesn’t bother her! I’m sure she’d love these!